A friend of mine sent me this story of his time in the Marine Corps. Read through to the end, it’s a shocker. Another crappy day in paradise, or The things you see when you ain’t got a gun. Hawaii is a wonderful place. My father was stationed there in 1945 or so, working at Wahiawa Naval Communications Station on Oahu . When I joined the Marines in 1977, one of my personal goals was to travel as much as he did, at least try to. I was lucky enough to get stationed in a unit that deployed on ship at least once a year to distant places from the Atlantic Ocean . In 1978, I traveled to northern Europe; to Germany, Scotland, Norway and Holland. In 1979, while waiting for the next deployment, this time to the Mediterranean Sea and to Turkey , all of a sudden we were told of orders to Okinawa , another place where my unit had a permanent presence at, Marine Corps Air Station, Futenma. Well, I didn’t want to go to Okinawa, I wanted to go to Turkey ! I wanted the Med, I could get orders to Okinawa, or “The Rock” as we called it anytime in my 4 year tour. So I passed on that deal. 3 days later, Staff Sergeant Day approached our work detail behind S-4 and announced, “Hey, there’s an error, of those 8 billets for Okinawa, 2 of them are for Hawaii!” “I’ll go!” I shouted! Who cared about Turkey when Hawaii was available! Smitty also spoke up and off we went a few months later, to spend 2 years of duty at what is one of the most beautiful places on Earth. Well, it sure was beautiful, I’ll say that. When I got there, they had a bus take us from the airport in Honolulu to my new base, Marine Corps Air Station, Kaneohe Bay . It was on the northeast side of Oahu, it was the north shore but no one used that term for that side of the island, it was just called K-bay. To get there, we took the Nuuanu Pali Highway, and one of the most pleasant surprises anyone can get in early November is to drive up the Pali and go through the mountain in daylight. The view was breathtaking, on my right was a sheer wall of green mountain and grey rock, the road cut into the mountain like in some Swiss Alps scene or some place in the Andes, and to my left was an open expanse and a drop of almost 1000 feet to the basin of a crater, long ago filled in with green vegetation, homes, telephone lines and all the modern accoutrements of the late 20th century, only you didn’t see any of that. All you saw was the green mountains towering up, 1800 feet I was told to the summit, jagged but grass covered, almost vertical, sloping sharply down to almost the bottom and then becoming the basin where life began on that side of the island. All of us new guys screamed in delight, literally, excited to the beauty of it all while those who had been stationed there for a while laughed and smiled at our astonishment, knowing that is how they reacted their first time. Hawaii was not such a friendly place as it was beautiful. In fact, on the 15th and 30th of every month, it was downright dangerous for servicemen, especially if you were not a Marine. We all heard the stories; the Hawaiian locals hated us, the haoles, and hated Black Americans, pupuas, even more. Marines had a reputation that most likely they had to outnumber you 10 to one before you got attacked. Soldiers, Sailors and Airmen didn’t have it so lucky; they got outnumbered 2 or 3 on one right away. If you saw a pack of Hawaiian men about age 20 or so, you left the sidewalk. Back then, Marines were the only service to wear their hair the way men wear their hair commonly today: short, cropped, and high and tight. All the other branches allowed longer hair so Marines stood out. 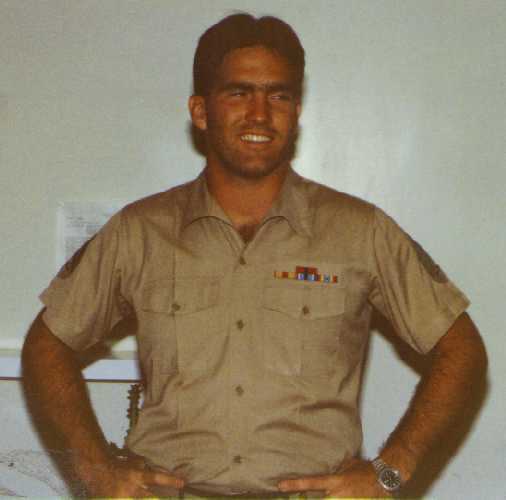 Plus, I was 6’4” since I was 16 and looked like a solid Marine in those days, I broke up fights between locals and servicemen, not once was I ever attacked, even 10 to one. Most of our days, when we had liberty, we would go to the local beaches. It was such a spoiler. Growing up in Connecticut, to me the beach was Barkhampstead, some lake, a gorge in Granby called Enders, and if someone had a car, we took the 2 hour drive to Misquamicut, Rhode Island, to swim in the ocean. My family rented a cottage each year in Cape Cod , sometimes for 2 weeks at a time each summer. It was heaven to be there those short times. But to live in Hawaii? The beach was everywhere! Honolulu was a rarity, when we went to the big city, we mostly didn’t go unless it was payday night because we just didn’t make money like civilians did. In 1980, I was making $679 a month as a Corporal, and that aint a lot in a place that charged $150 a night for a hotel room in the days of Jimmy Carter’s malaise. But, we did go, spent all our money, and dated the tourist girls from Canada who seemed to love Marines. I guess our perpetual tans and fit physiques helped a little. Gordon Liddy was the chief of what was called the ‘Plumbers” in the Nixon White House. During the Watergate scandal, many secrets of the Nixon administration were revealed, most of them known to be performed by both political parties, but, the media wanted to show support for the democrats and every slight that could be connected to Nixon was done and G. Gordon Liddy was questioned before Congress. Liddy balked and refused to rat out his friends and associates! Liddy manned up, admitted nothing, and was found guilty anyways and sent to jail. Well, that proved embarrassing, so I quickly apologized and stepped back, I honestly didn’t know he was an officer and wouldn’t have spoken up otherwise, but the blonde guy stood next to me after I stepped back, sort of like watching me. I remarked how that must happen a lot, but the blonde guy said no, it didn’t. I took that as a hint and about faced after another quick apology. I met a few people who were in the papers that year. Before we left Hawaii, while our ship was taking on Marines and equipment in Pearl Harbor, the NFL had its first PRO-BOWL game in Hawaii and the players were given a tour of Pearl and I happened to see them and summoned up my courage to ask for autographs. I got some from Bob Baumhour, Randy Logan, Walter Peyton, Bob Smith, Joe Lavender and one other whose name escapes me. That was a thrill, I still have the dollar bill they signed. But the next man I want to speak of is the most important of all. And I want to express here, what I am about to tell you, I believe with all sincerity and truthfulness. I am making nothing up here, except maybe a few words to keep a written dialog in readable form, but I believe I met Barak Obama in Hawaii in 1980 in Honolulu . It was after we had come home from that float. The rescue attempt had happened in Iran. My squadron was flying search and rescue the day the aircraft left the USS Nimitz on the afternoon of April 24, 1980, in the Arabian Sea. After the mission was aborted and the crash happened, our ship had set sail to Mombassa for liberty. The ship spent 4 days in Mombassa, but due to some Marines stealing a radio, I was a brig guard for the month and only had 2 days ashore. I made time to go on a short safari in the Tsavo East National park, seeing elephants and hippos in the wild, some gazelles, water buffalo, some large birds and one particular lizard the size of a German Shepard that I held up for everyone to take pictures of while it lazed about in the daytime sun. Why it didn’t bite me, I can only thank God. While back in Hawaii by late June of 1980, we went back to Honolulu for liberty. I don’t remember the exact address, or the exact business, but one August night, early August 1980, I stopped at a small shop that was either on Kalakaua Blvd or the street just north of it, one block north. I struck up a conversation with a young man, Mulatto, about 18, all teeth, smiling, skinny, short hair that I remember, at least short for the year we lived in. He told me he lived in Hawaii. Not too many black Americans lived in Hawaii at all, now or then, so he being there was an oddity. I asked if he was in the service and he said no. I told him that I was a Marine and had recently gotten back from float. We spoke of world travel at this time and I told him the places we went to. He also told me something that I never forgot, for it caused me to do some other things in an effort to be nice to him and possibly a favor. We spoke of where I had been and the world as I saw it. I told him I had been to Africa , Mombassa specifically, and he said to me abruptly, “I was born there”. I told him he is not eligible to be president if that was true, but I remembered he said his mom was an American, so, maybe it was okay. But it was what I did after that makes this a true memory: I went back to the barracks and told others of this guy and suggested we all grab our photo albums and visit him again and show him pictures of Mombassa so he could see where he was from. No one wanted to go, and at that time, my camera had failed me weeks before we hit Mombassa and it was late August or early September until I had borrowed someone else’s pictures to develop myself so I had copies of where I was. But I never forgot meeting that man for those reasons. I was going to do him a favor and show him his home country of birth. And I never went back for some reason, most likely I forgot to or just felt that a one time chance encounter would be meaningless to both of us and didn’t mean we were friends. In the light of what is called “The Birther” movement, these memories are still foremost in my mind concerning this. While I cannot swear it was Barak Obama, all the details I do remember of that chance encounter fit the profile of the man who some people claim is born in Kenya and others claim he was born in Hawaii . The man I met was about 18, thin, Mulatto, told me he was born in Mombassa, raised overseas, was living in Hawaii and hadn’t yet been to many places in the world outside of those places, mostly, hadn’t been to the mainland of America for any long time period if at all. And he openly told me he wanted to be President. And I remember that face, the face of a young man who sat on a table to my right front, his hands resting on the edge of the table, him leaning forward, his smile, all teeth. It was Barak Obama. I don’t know if I’d bet my life on it, but I am willing to tell people openly at the risk of my ridicule. I was there, and saw him, spoke to him, and he openly told me he was born in Mombassa, Kenya, not Hawaii . Does it matter? Of course it does. It should not have to be explained as to why it matters. Ed Note: A revised and updated version of this posting is available here. Our paths may have crossed, small world. Do you know the name of this marine? Actually he just sent me an updated version of the story which I may upload soon. If I do I will link to it from the original here. The story falls apart when he says that “it was obvious he never set foot for any time in the continental United States.” In August 1980, Obama had already completed his freshman year at Occidental in Los Angeles. Heh, Assuming that Occidental could be considered part of the continental US! That’s assuming that Barry took classes at Oxy’s main campus. Do we know for 100% sure that he did NOT take classes overseas (or out of state)? Well, and it could be that BO lied about Occidental. How do we know if he went there or not, have we seen any evidence that he has? Didn’t his mother take him to Washington with her when you went there to college? He probably couldn’t remember it because he had just been born. I have heard of others who stated that BO was born in Kenya, and they were on the WND Forums about this. You just never hear from them again. I remember one person saying they went to college with him, can’t remember which college right now, and BO was telling a group of people where he was born. Hmmm, are you saying that he better watch out? 1. How do we know that you aren’t an O-bot who has simply found a photo of an unknown marine and uploaded it as your avatar, and written a fantasy to go along with the picture? 2. How do we know you aren’t attempting to make fools out of people who want to believe your story, so that you can take attention away from the true eligibility problem for Obama (http://jeffersonsrebels.blogspot.com/2009/11/graphic-defining-citizen-vs-natural.html)? 3. If I’m wrong, are you willing to upload an image, for example, of a military insignia, birth certificate, etc. that has your name on it? How about a dated, recent image of yourself wearing a clearly visible name insignia? 4. Is Race Bannon your real name or a pen name? Race Bannon is a pen name for this Marine on Free Republic. He is known to me personally for years. He is quite upfront that he is not certain it is the same person, but the coincidences certainly increase the likelihood. He undertook writing this after he orally recounted the story to his English Lit professor and she asked him to put it in a paper. I trust this man completely to be honest about his experience. You will have to make your own decision on that matter. That’s because you looked for “Race Bannon” instead of “RaceBannon.” The space makes all the difference in the world between finding nothing and finding many thousands of posts over the past 12 years. If this is a fact issue, why has this guy waited so long before he placed into public view?